For the fourth entry in the Sartana series, genre regular writers Roberto Gianviti and Giovanni Simonelli seem to know what they are doing and give the film a good number of 'Sartana' moments with the hero always one-step ahead allowing clever gunplay and a few gadgets (although the best gadget in this one actually belongs to the villain) with a lot of dark humour. The story itself is not the most original, a pretty typical Spaghetti Western series of events with a mysterious gunslinger arriving in town, investigating a killing, fighting off a few waves of hired killers and eventually solving the mystery. The pacing is rather on the slow side and the ending in particular could use a little trimming, but it is never dull. Behind the camera we find Giuliano Carnimeo (credited as usual as Anthony Ascot) who does a solid job, with a few fancy camera tricks thrown in, in keeping with the direction of the other Sartana films. An effective if not too inspired Bruno Nicolai soundtrack provides a good backing. Garko reprises the lead role after being replaced in the role by George Hilton in C'è Sartana... vendi la pistola e comprati la bara (1970) and as usual gives a very fine performance, perfectly suiting the dry wit required for the part. A fine selection of familiar faces fill the rest of the parts, including the instantly recognisable Franco Ressel (Sabata (1969)) as a blackjack dealer and the beautiful duo of Helga Liné (Nightmare Castle (1965)) and Daniela Giordano (Four Times that Night (1972)). A third sequel to the 1968 original, Buon funerale, amigos!... 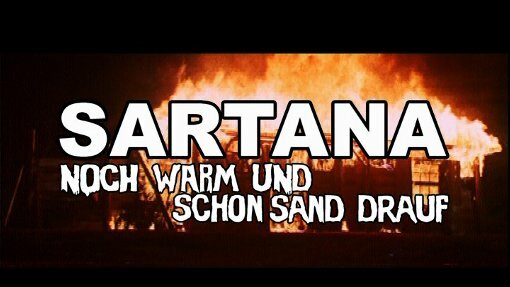 paga Sartana shows the formula starting to slow down a little, with a rather generic storyline and soundtrack - but there is more than enough dark humour to entertain fans and Garko is on typically strong form. Certainly of interest to genre fans. Any gore or violence ? Plenty of typical Western violence, nothing particularly vivid. Who is it for? Fans of the Sartana series and Spaghetti Westerns will enjoy this. Visuals Original Aspect Ratio - 2.35:1. Not anamorphically Enhanced. Colour. Picture quality is generally strong with good colours - light speckling and medium grain. German mono - sounds okay although there is some background hiss and crackling throughout. Subtitles Forced Subtitle Track - German subtitles are forced when English audio is selected. These are confired to the bottom matte and on some televisions can be completely cut-off when zooming in to 16x9. Availability This disc is available on its own in an amaray case or a hardbox (a large non-standard case). It is also available in the Italo Western Collection which includes 'Django Kill', 'The Greatest Robbery in the West' and 'My Name Is Shanghai Joe'. Other regions? Also available from Suevia Films in Spain, with Spanish and Italian audio. Cuts? Believed to be fully uncut. The print is Italian language, but the film's title card is a rather crudely added German text. Not the most original storyline, but some good dark humour and an effective Garko performance makes this worth catching for genre fans. Although non-anamorphic, there is a good looking print with nice English audio, but it is let down somewhat by the annoyance of the forced subtitles. See our reviews of more Gianni Garko and Spaghetti Western DVDs. All text in this review written by Timothy Young - 19th July 2009.